The English magazine Pabular was first published in 1974 by Nick Bolton and ran for just over eight exciting volumes. It was mainly edited by the well respected Fred Robinson (later by Walt Lees and Stephen Tucker) and the art editor throughout was the talented Eric Mason. The contributors include: Jack Avis, Gaeton Bloom, John Carney, Peter Duffie, Alex Elmsley, Dominique Duvivier, Cy Endfield, Bob Farmer, Flip, Piet Forton, Roberto Giobbi, Paul Hallas, Steve Hamilton, Francis Haxton, Larry Jennings, Peter Kane, Fred Kaps, Gerald Kosky, Trevor Lewis, Ed Marlo, Bob Ostin, Patrick Page, John Ramsay, Bob Read, Sam Schwartz, Arthur Setterington, Al Smith, Juan Tamariz, Stephen Tucker, Dai Vernon, Roy Walton, Tommy Wonder and William Zavis. SPECTATOR MAGICIAN (Tony Faro): Here is a great card effect entirely performed in the spectator hands and totally impromptu. You'll never stop using it! SLOW MOTION RING RELEASE (Peter Kane): A ring is threaded onto a piece of string (or rope) and it becomes free! COLOUR-PSYCHOLOGY (Stanton Carlisle): Four envelopes are shown and three are selected by spectators. They open the envelopes and inside they find consolation messages, while the last envelope (for you) contains a $100 bill (or any bill denomination)! ONE AT A TIME COLLECTORS (Alex Elmsley): Three chosen cards appear, one at a time, reversed among the four Aces! UP, DOWN & AROUND (William Zavis): Four black cards penetrate, reverse themselves among and change places with a number of red cards Great packet trick! SIMPLICITY (Trevor Lewis): You show Ace to Five of Spades (or any five cards). A spectator THINKS of one card and then names it. The card is removed. The remaining four cards are shown to be (say) blue-backed and the selection is the only red-backed card! 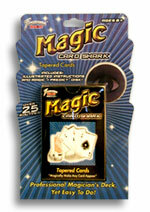 PAIRED CHOICE (Francis Haxton): Two freely selected cards appear at the same time while you deal two packets of cards! CHOP-COIN (Arthur Setterington): Two different coins are wrapped in a banknote and secured with a clip which is placed on a chopstick. You ask for a coin to be named. The selected coin disappears from the note. Everything can be examined! GONE SANDWICH (William Zavis): The two red Aces are inserted face down into a half of the deck. A selection is inserted in the other half. The Aces disappear from their half and reappear in the other half trapping the selected card! DIARY DICE-CARD (Des Colgan): You show a diary (or a calendar) and a spectator selects a card. The same card is printed in the diary on the day of the performance! Simply enter your details below and we will send you an e-mail when “Pabular Vol. 1 by Wild-Colombini Magic - DVD” is available to ship!